Included with the Iridium Extreme are two adaptors. These adaptors attach to the bottom of your phone and are required for charging, connecting the USB data cable, or using the external antenna. These adaptors are designed to provide a robust and flexible approach to using external accessories with the Iridium Extreme. to a laptop via USB data cable when the phone’s antenna is used. 1: In order to charge, use the USB port, or connect an external antenna, the appropriate adaptor must first be selected and attached to the bottom of the phone. 2: Prior to installation, open your phone’s accessory connector cover on the bottom of your phone and move it to the back of your phone, securing it to the rear retaining features. 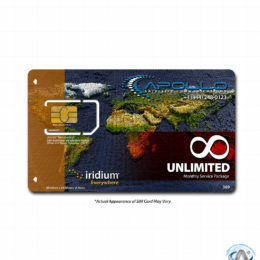 3: Select the appropriate adapter and orient it with the bottom of the phone so the Iridium brand is facing forward. Then press the adapter up until the side clasps are locked into place and the adapter is securely fastened to your phone. Once the appropriate adaptor is installed on the phone, you may now connect the charging, USB data, or external antenna to your phone. Note that the Charging/USB/External Antenna adapter should only be used if you are planning to connect an external antenna. While this adaptor is connected, use of your phone’s antenna will temporarily be suspended. Last, move the accessory connector cover back to the accessory connector and press it so it is securely in place. Notice: Ensure accessory connector cover is fully and securely installed. Failure to do so could result in dust and/or moisture being introduced to the unit which could in turn cause failure of the unit.